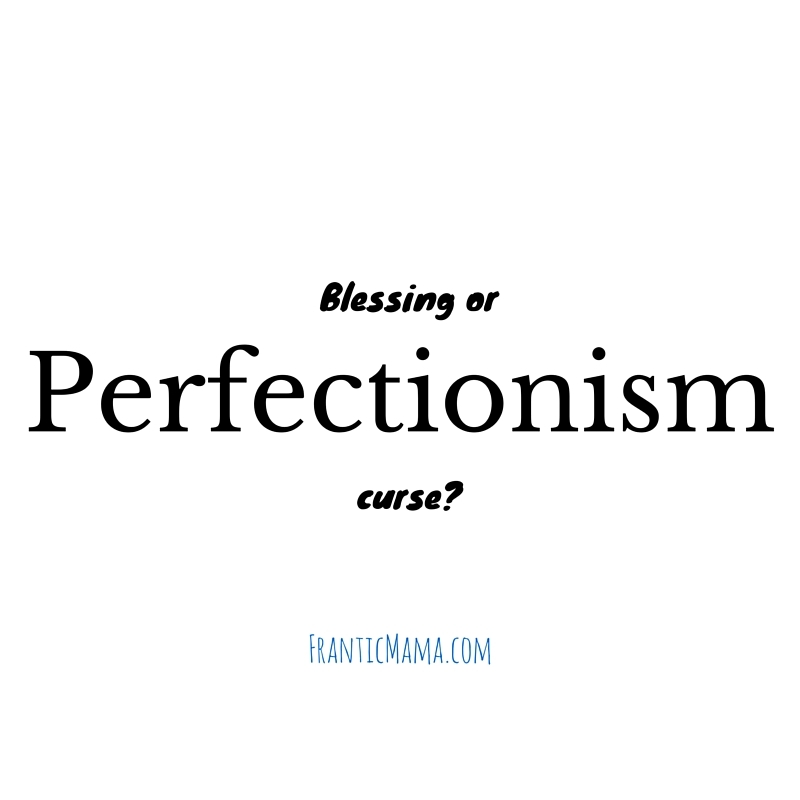 Frantic Mama: Perfectionism: A Blessing or Curse? It's the age-old standard interview answer you are told to give when your potential employer asks the dreaded, "What's your greatest weakness?" question. "Hmmm," you're supposed to say, wrinkling your brow, thinking hard. "I guess I'd have to say my perfectionism. I have a never-ending need for everything to be perfect." "The job's yours!" The interviewer is to respond joyfully, amazed by the fact that you must not have any real weaknesses (and that they've never ever heard this response before). For those of us who really do constantly feel the need to be perfect in many (or all) of our endeavors, it can technically be a weakness. And also a strength. I've been thinking a lot about perfectionism recently-- what it means and how it affects my life. I've come to this conclusion: It affects my life a lot. To tell you the truth-- and it makes me feel quite vulnerable to reveal this-- it is challenging for me to find one single area of my life where I don't strive to be as close to perfect as I can. Perfect at writing? A must. Perfect at being a "good" parent? A must. Perfect skin/hair/style? Ideally, yes. Perfect friend/wife/daughter/sister? A constant need. Perfect at whatever hobby I'm pursuing? You guessed it-- I'm relentless. I'm tired just re-reading this list. Everything else? Letting go is very hard for me. I don't always succeed at all my perfectionist goals, of course. Logically, I know it's impossible. There's no such thing as Perfect. More times than once, for example, I've fallen short on the style factor (I've gone to preschool drop-off in slippers, forgetting to switch to normal shoes). And as the rational side of me also knows there is no such thing as a perfect parent, I am still hard on myself for those times I royally mess up my role as a mother. Plus, I could always be a better friend/sister/daughter/wife, couldn't I? In fact, there are a million ways I could be better at X,Y, and Z. So is perfection a crippling weakness, making people like me incessantly spin the wheel like frantic little hamsters? Not totally, I think. Yes, the drive within us is tiring, and it can be self-defeating and deflating, but then again, don't those of us with that intense care to excel tend to create more, produce more, and even experience more success (at least, professionally)? I hope so! Still, when falling short of perfect brings me down (emotionally, mentally, physically), ah that's when perfectionism becomes my achilles heal and I daydream about being a Type B. Therefore, my second conclusion? This trait is a blessing and a curse. Given the choice to have it or not, I guess I wouldn't give it up, but it would be pretty awesome to "turn off" if I needed a break. What about you? What's your achilles heal? Let's connect on Facebook, Instagram, and Pinterest. This is such a 'perfect ' brilliant post!! Perfectionism,yes, it won't let you stop at nothing but it will take you places unexplored! It is like climbing over a mountain. Uphill makes you breathless but the view! THE VIEW!! Ah, thank you so much! I felt a little 'exposed' writing it, but it is what's been on my mind recently, so I hoped others might read it and relate. Your manifestations-- yes-- a blessing and a curse in a similar way! For, without them, you wouldn't ever get around to creating and being in touch with your artistic side, but with it, well, you sometimes can't complete other more 'practical' projects. I can relate to that as well, and you know, come to think of it, I'm usually much happier when I give into the creative impulse even if the rest of the house falls apart :). I'm SO glad you are painting again!! You have talent! This is so funny to read this today - I did a free write yesterday (that will become a blog post) on perfectionism. I have that drive too. 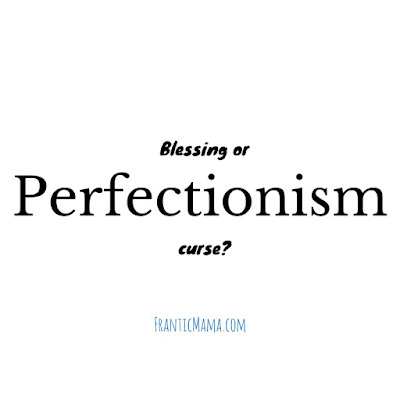 (And I think I actually have answered "perfectionism" as my greatest weakness. *laugh*) But yeah, it IS exhausting! I have started to overcome it in some areas, although if I was to have to describe how I'm doing that... I'm not sure I could. It's more like a continual talking to myself that some things can be imperfect and not matter. Ugh. Perfectionism must be in the air! :) I can completely see how you relate. Your perfectionism comes across in your attention to detail in your art and in our business group. And I mean that as a compliment!! :). Yes, exhausting, I agree. I like your idea of 'continual talking to yourself' as a way to cut yourself some slack when things can't or don't need to be perfect. Inner dialogue is important! And thank you for reading and for your ongoing support :).